The Jewish school in Berlin included Jewish Law and Bible as part of regular matriculation tests accepted by ministry of education. 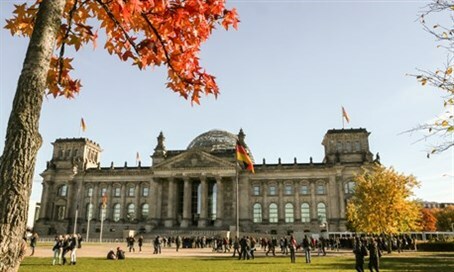 For the first time since World War II, the German education ministry has included the study of Jewish law and the Hebrew Bible as part of their matriculation exams. According to the new reform, private schools in Germany may now include a variety of new subjects together with those that traditionally appear on matriculation tests. The only school in Berlin that took advantage of the new rule was a traditional Jewish school in the city which instructed its students to prepare for matriculation exams in Hebrew, Jewish law (halacha) and Tanach. The Religious Jewish school in Berlin was founded a decade ago by Rabbi Yehuda Teichtal and serves as the only religious Jewish school in Germany. “We began as only an elementary school” said school principal Rabbi David Gviretz to the Lubavitch website "Shtoram." Gviretz said that the students were tested on the laws of Kashrut, and were the first students ever in the country to take official matriculation tests on Torah and Jewish law. The mark on this matriculation test will join their average for all of the matriculation tests and will become an integral part of their overall final grade for the matriculation exams.